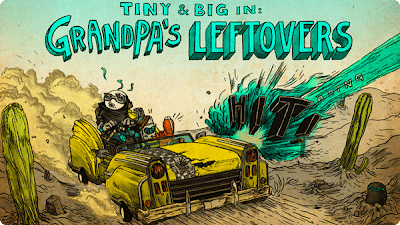 Black Pants Studio's action platformer game Tiny & Big in : Grandpa’s Leftovers can be now pre-ordered for $12.99 (Windows, Mac, Linux). Tiny & Big is a comic styled jump and slice platformer that gives you the unique ability to shape a whole world at your will. You are Tiny, a nerdy inventor who tries to reclaim his most beloved possession: Grandpa's white, fine rib underpants. On his journey through a forsaken desert he will meet mysterious creatures, no clowns, a taxi robot and his arch enemy: Big. Tiny is equipped with three basic tools to modify his surroundings, as a means to get to otherwise unreachable spots in the game, or slice and dice a level just for fun. He can use his mighty laser to cut and form any object at will. To move objects, Tiny can choose between a grappling hook to pull, and a rocket to push pieces into position. Of course, as the game proceeds, combining your tools gives the player a unique and sandbox style of possibilities to solve puzzles. Creative jump 'n' slice gameplay – use grappling rope, rocket science and laser surgery to slice the whole world, overcoming all obstacles in your very own way. Unlimited slicing freedom and unique sandbox gameplay. Experience believable physics in a completely destructible, immersive environment. Character-driven story-line - follow Tiny into a weird and humorous story drenched in peculiarity: get back grandpa's underpants, by all means necessary. Collect more than 15 songs from hardly known but genuine indie bands. Their earlier episode in the game series, Tiny & Big in: Up that Mountain has been quite popular because of its unique physics based gameplay. You can try a free demo available for Windows, Mac and Linux. Grandpa's Leftover will be released on June 19th.